The Preface of The Strawberry Story: How to Grow Great Berries Year-Round in Southern California describes how it’s not only possible, but downright delicious, to grow strawberries throughout the year in So Cal. When I wrote the first edition of this book in 1993 with my co-author Sharon Whatley, I had no idea the staying power of the topic. I knew that I loved strawberries since childhood, and that few things are as sweet and satisfying as homegrown berries. I soon discovered that I’m definitely not alone. 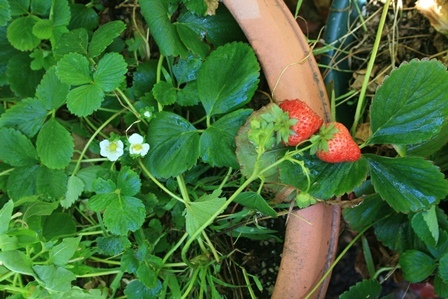 Since its publication, The Strawberry Story has sold more than 5,000 copies, and I’ve spoken to hundreds of audiences about how to grow big, juicy berries right in your own backyard. Over the years since the first publication, I’ve experimented with new varieties on the market, as well as growing strawberries in containers and organically. I’ve found great varieties that make harvesting strawberries year-round possible, and in this book I share those types and how to grow them pesticide-free in any garden. I am not shy about my fondness for one strawberry in particular—Seascape. On many occasions, no matter the season, I can go out and pick at least a small handful of these big, tasty berries. One of my favorite Seascape harvests of all time occurred on a Christmas morning several years ago. Of course, growing strawberries is also a great gardening activity to enjoy with kids, and my children have definitely had their share of fresh, homegrown berries. My hope is that this book will help you grow and enjoy your own sweet strawberries on Christmas morning and throughout the year.